1. 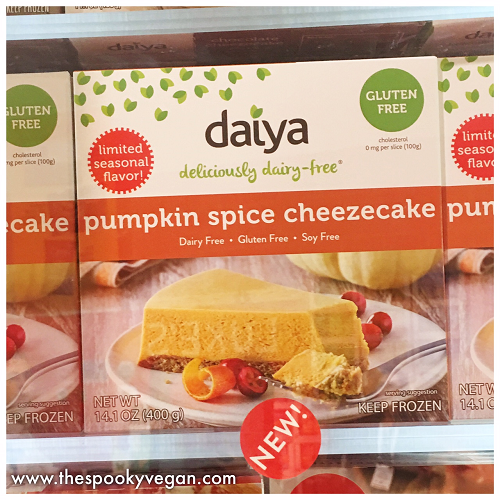 Daiya Pumpkin Spice Cheezecake - This was the best thing I put in my mouth all Expo!! As you probably know, I am obsessed with all things pumpkin spice, so this was the product I was most excited for and it did not disappoint! It was creamy, dreamy, and had just the right balance of sweet and pumpkin spice. This will be a seasonal product, so look for it this fall! 2. 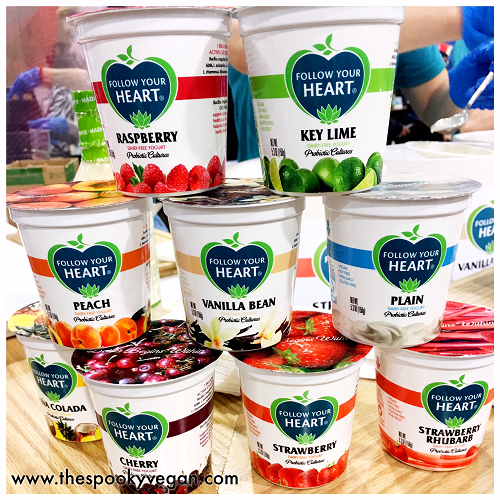 Follow Your Heart New Yogurt - There were A LOT of vegan yogurts at Expo this year, but the best I tried were from Follow Your Heart! They are made from a coconut base and full of real fruit and probiotic cultures. They are soy-free, gluten-free, and non-GMO as well. The consistency of FYH's yogurts was perfect and I loved the real chunks of fruit in some flavors. The variety of flavors was awesome, and they included Strawberry Rhubarb, Key Lime, and Pina Colada! Look for these in stores early this summer! 3. 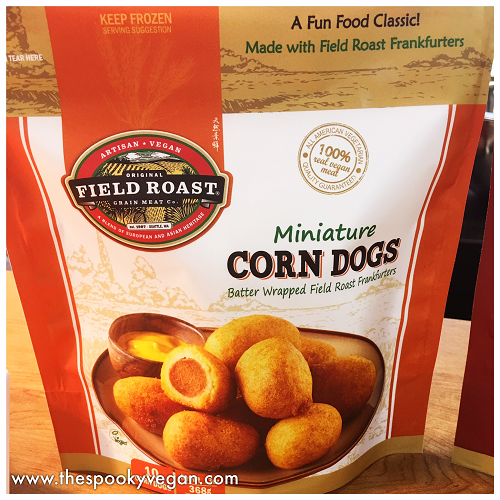 Field Roast Mini Corn Dogs - Field Roast had so many new vegan products this year (check out more below!) that it made it tough to choose a favorite, but these mini corn dogs totally won my heart! They had the perfect batter-to-hot-dog ratio, and the batter itself was delectable! They are made with Field Roast's own Frankfurters, so you know they are good! These will be in stores later this year - look for them in the frozen section. 4. 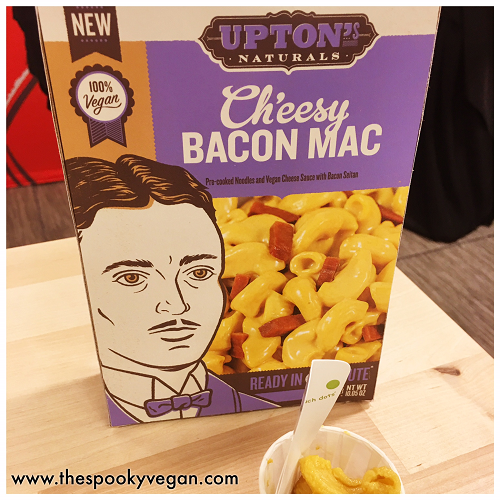 Upton's Naturals Ch'eesy Bacon Mac - This prepared vegan mac and cheese only takes one minute to prepare (the pasta is already cooked!) and has an incredible smoky flavor. I really liked the nice firm al dente bite of the pasta. Definitely a winner and I can't wait for it to hit stores! Their other new products (check 'em out below) are delicious as well! 5. 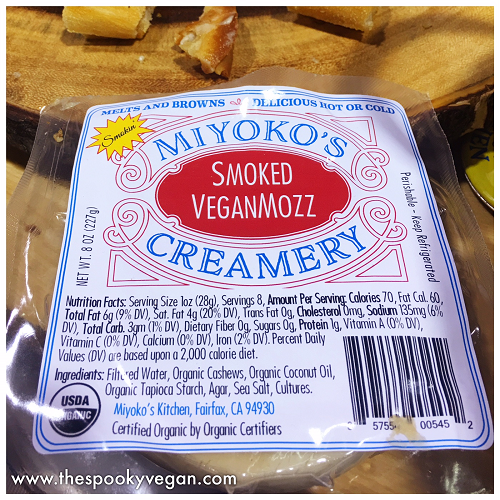 Miyoko's Kitchen Smoked VeganMozz - I didn't think Miyoko's could get any better, but this smoky vegan mozzarella blew my mind! The flavor is unbelievable and I can't wait to get my hands on some of this stuff! It is gonna elevate breakfast sandwiches, pizzas, grilled cheese, and so much more! 6. 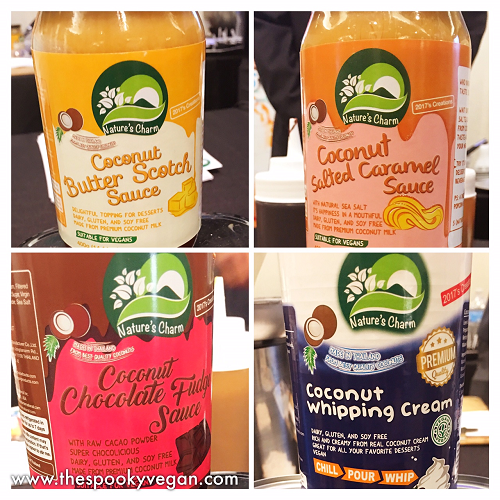 Nature's Charm Vegan Sundae Sauces and Coconut Whipping Cream - Nature's Charm are coming out with three new coconut-based dessert toppings - butterscotch, salted caramel, and chocolate fudge - plus a new coconut whipping cream! I could not get enough of these toppings and can't wait to have vegan ice cream sundaes topped with their coconut whip and sauces. 7. 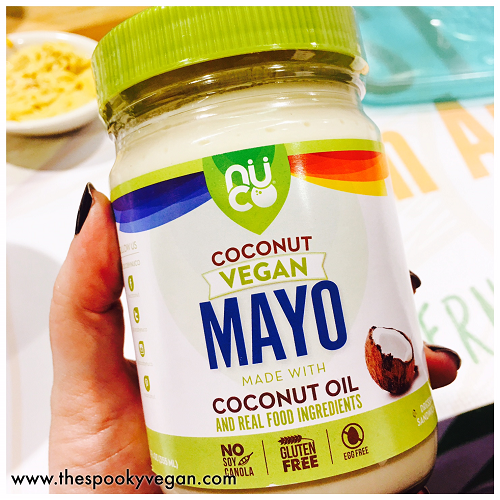 NUCO Coconut Vegan Mayo - There were a few new vegan mayonnaise options at Expo, but NUCO's coconut and avocado oil based mayo was my favorite! It had a fantastic creamy texture, just the right amount of fat to give it a good mouthfeel, and it had a great tangy taste! Plus, it is made with clean ingredients with no weird additives. You can buy it on Amazon! 8. Vegetarian Plus Tuna Rolls - These vegan tuna rolls come in two individually wrapped rolls, and you can make all sorts of thing with them. 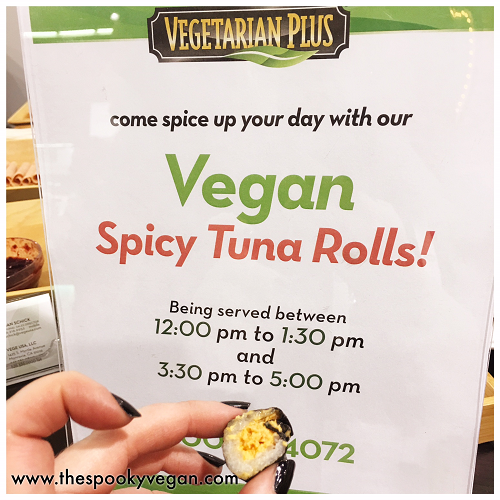 The chef at the Vegetarian Plus booth made these incredible spicy vegan tuna rolls and I stood there for a few minutes sneaking several samples. They taste so freaking good, I can't wait to make my own sushi rolls with them! Vegan sushi party, anyone? 9. 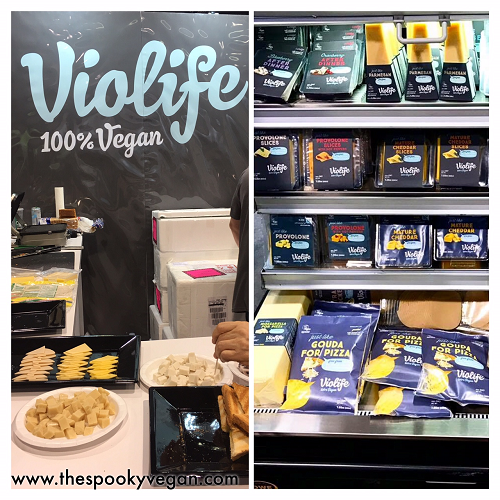 Violife Vegan Cheeses - Like past years, Violife's cheeses were a real standout of Expo! I tried their new after-dinner dessert cheeses stuffed with blueberries and cranberries as well as sampling some of my old favorites (like their parmesan!!) and loved everything. Their cheeses will be available online through Vegan Essentials next month, and they are still working on getting distribution to stores in the U.S.! 10. 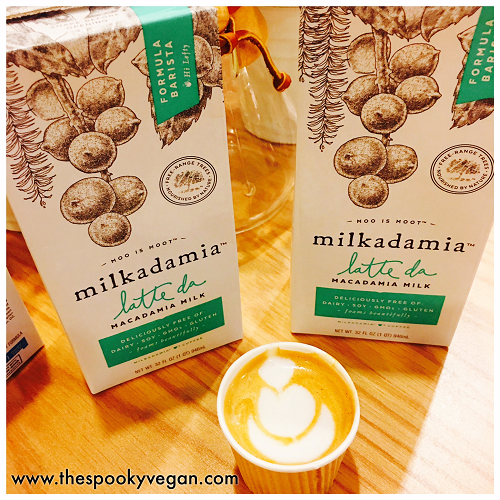 Milkadamia Latte Da - Milkadamia was my favorite beverage at Expo last year, and now they are releasing this incredible latte drink! I tried a cappuccino they made with it, and the caramel and marshmallow flavors were delightful! You can already buy this on Amazon! 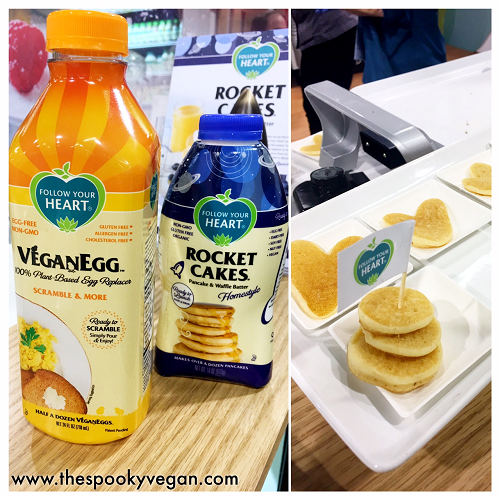 Follow Your Heart Rocket Cakes and Ready-to-Pour VeganEgg - Rocket Cakes is a brand new, ready-to-pour on the grill liquid pancake batter that will make vegan pancakes even easier to make! They were also showcasing their pre-mixed liquid VeganEgg in a container that is easy to pour. Both of these will be released in the fall. 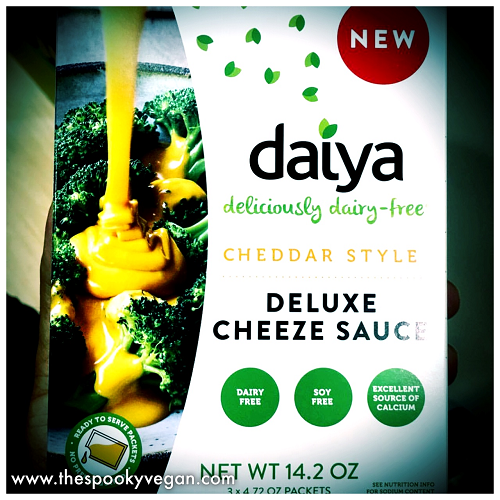 Daiya Deluxe Cheeze Sauce - Just the cheese sauce (the same that is sold with their mac and cheese) will be sold in packets of three so you can douse your veggies or make nachos! I tried some at Expo with some chips and it was delicious. It will be available in both their Cheddar Style and Alfredo Style flavors. 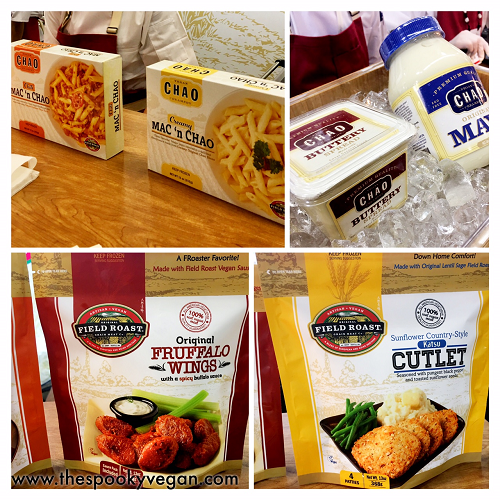 Field Roast Chao Mac and Cheese, Fruffalo Wings, Katsu Cutlets, Chao Buttery Spread, and Chao Mayo - OMG, Field Roast is releasing so many RAD new products and they all taste amazing! The mac and cheese was fantatic and uses penne pasta and comes in Original and Chili flavors. The Buttery Spread tasted amazing on bread and the mayo had a nice creamy taste. And drooling over the Katsu Cutlets and Fruffalo Wings! They also had three seasonal sausages - Hawaiian, Bratwurst, and Lil' Smokies! 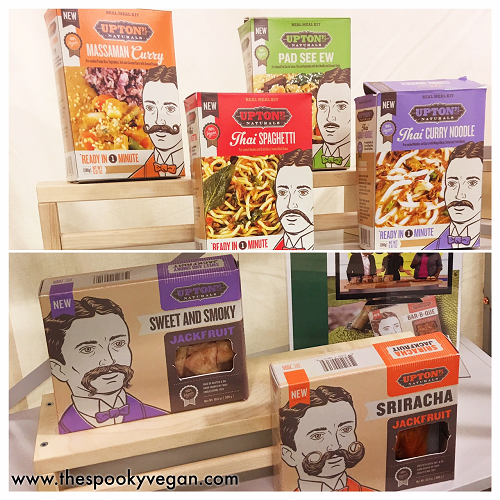 Upton's Naturals Ready-to-Eat Meals and New Jackfruit Flavors - Upton's unveiled four new shelf-stable vegan meal kits that feature pre-cooked noodles and real vegetables that are ready in just one minute! They are available in the following authentic Thai flavors: Massaman Curry, Pad See Ew, Thai Spaghetti, and Thai Curry Noodle. 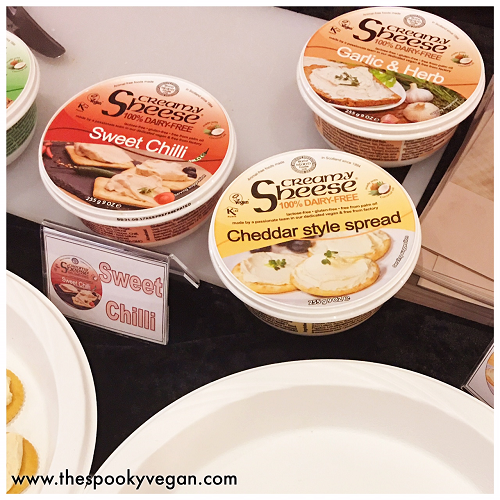 They also debuted two new jackfruit flavors, Sweet and Smoky (which is perfect for those that want a subtle BBQ flavor) and Sriracha! 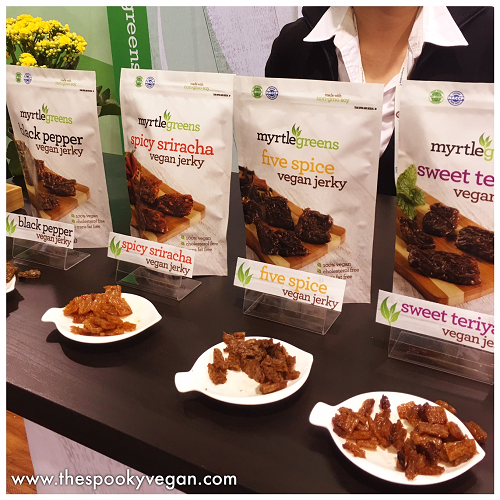 Myrtle Greens Vegan Jerky - I was pleased to see so many vegan jerky options at Expo, but my fave was the jerky from Myrtle Greens (who are affiliated with Vegetarian Plus). I loved Vegetarian Plus' jerky last year, and I think these might be the same ones re-branded. I'm hoping these finally hit stores this year! Bute Island Foods Sheese - This was my first time trying this Scottish vegan cheese that so far has only been available in Europe. It was soooooo good and they have so many different flavors. They were trying to find U.S. distribution at Expo, so I'm really hoping they get some buzz going so we can find it in the U.S. soon! 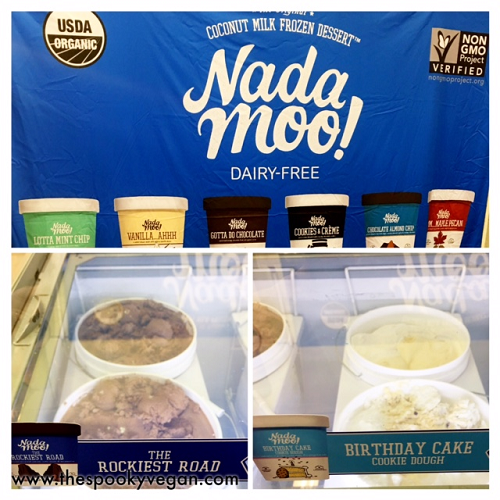 Nada Moo Birthday Cake and Rockiest Road Ice Cream - These two new flavors were released a month or so before Expo, but I haven't been able to find them at my local Sprouts grocery store yet, so Expo was the first place I got to try them! They were both phenomenal! The Birthday Cake had ribbons of yellow cake, chunks of cookie dough, and rainbow sprinkles in the vanilla ice cream, while Rockiest Road was chocolate ice cream studded with almonds, cookies, and fluffy marshmallows. Both flavors were incredible and I can't wait to find them at my local Sprouts! Again, it was fantastic to see so many vegan options and meet companies offering up cruelty-free food. It is always rad to see companies that care about animals, the environment, and people's health and develop delicious vegan food options. 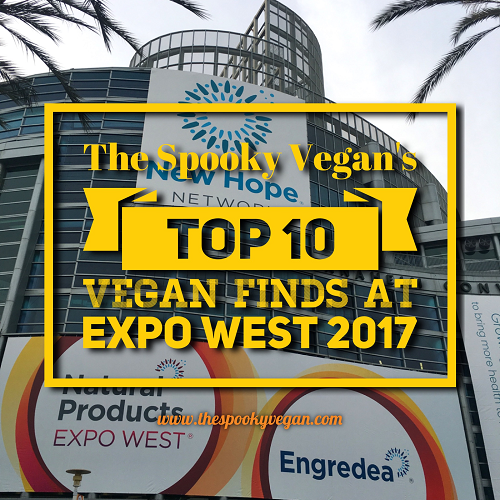 Another interesting note is that whenever I asked if companies had any vegan options, many said they were working on them! Seeing this kind of progress is pretty cool! Besides the food, I got to meet/see/hang out with so many awesome vegans. Part of the reason I keep going to this convention is all the amazing people I get to see every year. There is a vegan meet-up hosted by Whitney of Eco-Vegan Gal that grows in attendees every year, which is really heartwarming. Plus, it's always fun to meet fellow vegans you follow on Instagram! This was another Expo for the books, and though it is always overwhelming and exhausting (I walked over 10 miles in one day! 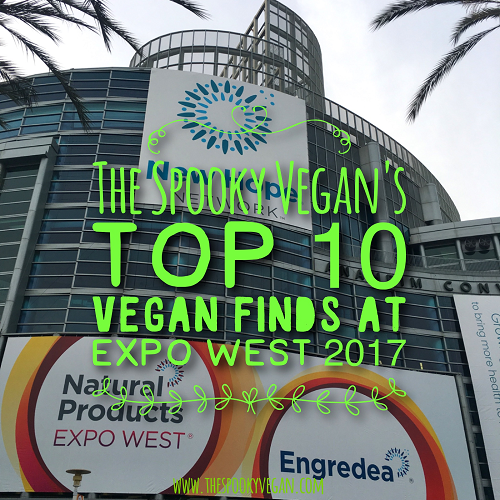 ), it is always rewarding because of the increasing amounts of vegan products as well as the people I get to see. I'm already looking forward to next year! Which of these new vegan products are you most looking forward to? If you attended Expo, what were your favorites? My mouth is watering. Its such a shame the South East won't see many of these products.